Homeowners avoid using chemical herbicides on lawns and gardens for fear of harm to the environment as well as health concerns. The ingredients in common weed killers, such as glyphosate and diquat, can irritate skin or eyes on contact. Some products may have more serious consequences if not properly handled. Additionally, because dandelions often grow among the grass blades in a lawn, killing the weeds will likely also damage parts of the lawn. Dandelions are not a cheerful sight for lawn-lovers. 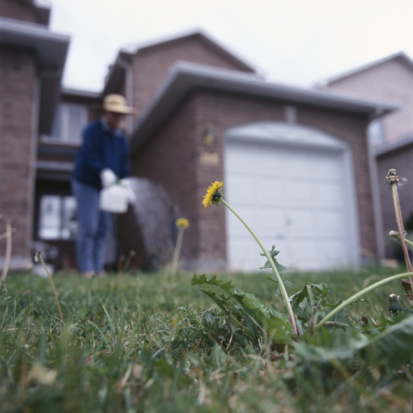 Because spraying weeds with even low-toxic or non-toxic sprays brings about the risk of killing sections of lawn, hand-weeding remains the best defense against existing dandelions, notes the U.S. Environmental Protection Agency. Patrol your lawn in early spring to find the plants pre-flower, with their telltale toothed long leaves. Before dandelions flower, non-sprayed plants are tender enough to toss into salads or cook like spinach. Weeding tools that have tines, such as dandelion forks, are the best way to remove the deep-rooted weeds. 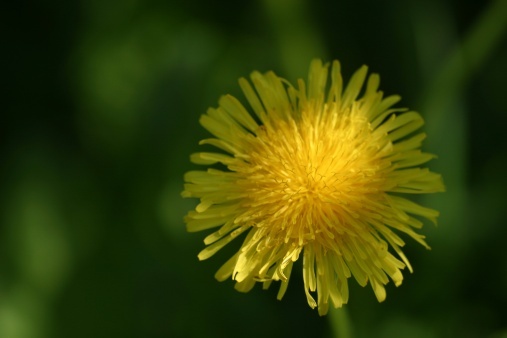 Remove dandelions as soon as possible, because once they move from the yellow flower stage to the dried, white seed-head stage, they become capable of spreading hundreds of seeds throughout your lawn. While the EPA endorses hand-weeding and preventative measures over low-toxic sprays, it lists commercial sprays in order of toxicity. Those with vinegar or fatty acids as the active ingredient were found to be less toxic than other sprays. They may be effective on large patches of dandelions which make hand-weeding difficult. Follow the manufacturer's instructions for application. Laying a tarp over the surrounding lawn before application will help you target the weeds rather than the grass. Corn gluten meal is often known as a "weed and feed" product because it prevents the emergence of weed seeds while also providing nitrogen to the soil. It will not work on existing dandelion plants, but a preemptive application of the product in early spring may head off many weed problems later. Because it works by killing all seeds before they germinate, the organic product is unsuitable for newly seeded lawns and garden beds. To cut down on weeding and herbicides, practice measures that prevent the emergence of dandelions. "Rodale's Ultimate Encyclopedia of Organic Gardening" recommends raising your lawn mower setting to 3 to 4 inches. Taller grass helps shade out weeds more effectively than close-clipped lawns. If you use compost or manure to fertilize your lawn, confirm that is fully matured. Non-aged manures and compost that hasn't "cooked" long enough may still contain active weed seeds.